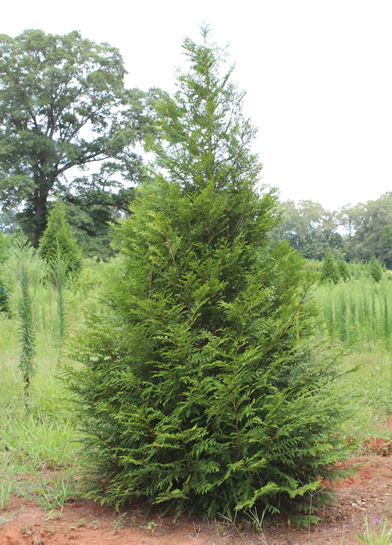 The Thuja Green Giant tree is an evergreen that is ideal for privacy. If you are looking for a way to block a neighbor or noise from a road or highway, these trees provide a beautiful, natural border. Thujas grow an average of 2 to 3 feet per year. At maturity, these trees can grow to be 35 feet in height and 15 feet in width. These trees are a vibrant green color until winter, when they the tips turn a golden brown. A fun fact about these trees is that they have an evergreen smell, much like a Christmas tree! The Emerald Green Arborvitae tree is a slow growing tree that keeps a compact pyramid shape as it grows. These trees can be planted next to your house as an ornamental tree or as a border to block the view of your neighbor. These trees will grow an average of 6 to 12 inches per year. At maturity, they will grow to a height of 15 feet and have a width of 3 to 4 feet. The Emerald Green requires full to partial sun and is low maintenance. As these trees are not fast growing, they provide a beautiful addition to your landscape, as well as privacy. This is the perfect tree to plant as a border in a small yard, since they only grow to be about 15 feet tall and they do not grow very wide.